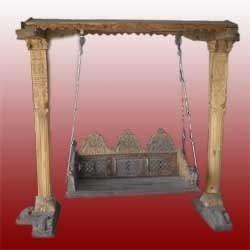 Our Wooden Decorative Swings are designed to enhance the appearance of your garden or other places. These Wooden Decorative Swings are offered in variety of designs, shapes, sizes and colors. 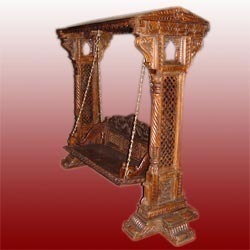 Our assortment of Wooden Decorative Swings are available at market leading prices. We are amongst the leading manufacturer, exporter and supplier of an extensive quality range of Decorative Indoor Wooden Swings. Our offered wooden swings are manufactured from high quality wood and are assembled with strong buckles for hanging them from any suitable height to enjoy a joy swing. Other custom-made finishes are also provided. These are widely used in homes and also enhance the decor of the houses. Over years, we have been successfully satisfying the diverse needs of our esteemed clients by providing Decorative Indoor Wooden Swings. It is designed and manufactured using the finest grade wood and other allied material in compliance with the defined industry standards. We provide these wooden swings in different customized form in terms of patterns, sizes and colors. Offered wooden swings are provided in best packing & checked before the final dispatch. Looking for Wooden Swings ?